1. One of the interesting phenomena of the civil war in Syria is the tacit understandings between two sworn enemies: the Assad regime and the terrorist organization ISIS. These understandings are about operating and marketing the products of the oil and gas fields, most of which are located in areas controlled by ISIS (see map). There are also arrangements for the distribution of electricity between the two sides. These understandings make it easier for ISIS to produce and market its oil and gas to the Syrian market. For the Syrian regime, they provide a (limited) solution to the shortage of energy resources in the territories under its control. A. Marketing crude oil and gas from areas controlled by ISIS to areas controlled by the Assad regime. This gives ISIS a share of the Syrian oil market and the resulting revenues (the Syrian regime relies on oil imports from abroad, mainly from Iran). B. Cooperation in the maintenance and operation of the oil fields, requiring skilled workers that ISIS lacks:The Syrian regime permits skilled workers affiliated with it to continue to operate the oil and gas fields, while ISIS grants them protection and sometimes even pays their salaries (sometimes their salaries are paid by the Syrian regime or jointly). This creates a reciprocal need between the Syrian regime and ISIS, and sometimes also between ISIS and the local population, which provides the work force in the oil and gas fields (this reciprocal need sometimes also serves as a lever for pressure). C. Supplying electricity to areas controlled by ISIS: one of the benefits that ISIS receives in return for marketing oil and gas products is electricity, supplied from power plants in areas controlled by the Syrian regime (there have been recent reports about an agreement of understanding signed between the Syrian regime and ISIS, regarding the operation of the thermal power plant in Aleppo). 3. In deals between ISIS and the Syrian regime for the purchase of oil and gas, middlemen are often involved. One of them is a Syrian businessman by the name of George Haswani, who is close to the regime, whose name has been put on the European Union's sanctions list (March 7, 2015). George Haswani, on his part, denied the allegations and threatened to sue the European Union (see Appendix). 4. During the civil war in Syria, ISIS managed to take over most of the oil and gas fields in northern and eastern Syria (an estimated 60% of Syria's oil fields). Since taking control of the oil and gas fields, ISIS has tried to continue to operate them (to some extent) and market their output in Syria and outside the country. ISIS's profits from the sale of oil products constituted one of its main sources of income. Until the beginning of the campaign by the US and the coalition, these profits were estimated at several million dollars a day. The high revenues from oil marketing significantly improved ISIS's military and administrative capabilities and helped it spread rapidly in Syria and Iraq. 5. ISIS's oil production facilities are a preferred target of airstrikes by the US and coalition forces. According to US reports, these airstrikes have significantly harmed ISIS's revenues from marketing oil and gas. However, in the ITIC's assessment, oil profits are still a major source of income for ISIS. 6. ISIS attaches importance to the establishment of a domestic Syrian market for the crude oil that it produces. ISIS strives to provide the population in eastern Syria, which is under its control, with inexpensive petroleum products. At the same time, ISIS also sells crude oil to other areas, outside its control, including those under the control of the Assad regime, which suffers from a shortage of fuel. For ISIS, marketing the oil is an important source of income and, at the same time, it creates dependency on the part of the Syrian population, mainly in areas controlled by ISIS. 7. One of ISIS's problems with respect to operating the oil and gas fields is the lack of skilled personnel. ISIS is dependent on a professional workforce, which it lacks. To this end, ISIS pays generous salaries to skilled workers and protects them so they will remain at their jobs and maintain the oil fields. This increases the interdependence between ISIS operatives and the local population (testimony of Matthew Levitt, submitted to the US Congress House Committee on Financial Services, November 13, 2014). 8. ISIS also strives to market the oil and gas to areas controlled by the Assad regime. To this end, it maintains ongoing contact with the Syrian regime. In September 2014, it was reported that an economic deal worth USD 3.6 million per month had been signed as part of the "tacit understandings" between the Assad regime and ISIS. The deal was reportedly signed through the mediation of George Haswani, a Christian businessman close to the regime, who owns a gas field in the area controlled by ISIS(see Appendix). George Haswani reached an understanding with ISIS over the transfer of crude oil and gas from the oil fields captured by ISIS to areas controlled by the Assad regime, in return for money and electricity (All4Syria, September 7, 2014). 9. According to a recent report, as part of the deal, the Syrian regime purchases 2,000 gas cylinders per day. The Syrian regime also pays ISIS protection money, intended to ensure the safety of the workers at the Thweinan gas field north of Palmyra (All4Syria, March 2015). It was recently reported that these ties have been expanded. In addition to the Assad regime being a consumer of oil originating in areas controlled by ISIS, its employees operate a number of oil infrastructures jointly with ISIS in return for a salary paid to them by ISIS (The Daily Telegraph, www.businessinsider.com, March 7, 2015). In some cases, the Assad regime pays for the oil by supplying electricity to areas controlled by ISIS (Telegraph, March 7, 2015). 10. On March 15, 2015, an independent Syrian news channel reported that an agreement of understanding had been signed between the Syrian regime and ISIS over the operation of the thermal power plant in Aleppo. According to the report, the agreement of understanding pertains to the division of the electricity supply between the parties, whereby ISIS will receive 60% of the quota and the Syrian regime will receive 40%. According to the article, the agreement is designed to solve the power shortage in the Aleppo province (Orient News, March 15, 2015). 11. On the other hand, ISIS tries to exert pressure on the Syrian regime through its control over energy resources. For example, the All4Syria news website reported (March 28, 2014) that ISIS had cut off the supply of electricity to the Deir al-Zor military airfield (ISIS has been trying unsuccessfully for several months to take over the airfield). In response, according to the report, Syrian Army forces attacked a power plant that supplies electricity to the eastern periphery of Deir al-Zor. ISIS responded by cutting off the supply of electricity to populated areas controlled by the Syrian regime in the area of Deir al-Zor. 12. Cooperation with the Syrian regime with regard to the production and marketing of oil is not limited to ISIS exclusively. Its rival, the Al-Nusra Front, Al-Qaeda's branch in Syria, cooperated in the past with the Syrian regime in this regard, until ISIS drove it out of eastern and northern Syria and it lost its grip on the oil and gas fields. 13. According to reports in the Arab and Western media (May 2013), at the time the Al-Nusra Front and its allies reached a tacit understanding with the Syrian regime. As part of this understanding, the Al-Nusra Front and the rebels ensured the continued flow of oil to western Syria in return for monthly payments estimated at over GBP 1.4 million. These understandings were reached through middlemen who were acceptable to both sides (The Guardian, May 19, 2013). In the ITIC's assessment, this loss of income as a result of being driven out of eastern Syria has harmed the Al-Nusra Front's military and political capabilities. 1. George Haswani is a Christian Syrian businessman from Yabrud (a town on the Syrian-Lebanese border, north of Damascus), who formerly served as deputy manager of the refineries in Banias. He studied in Russia, where he established ties with senior figures in the Russian security forces. George Haswani set up a company by the name of HESCO Engineering & Construction Co and, as result of his connections in Russia, obtained licenses to cooperate with Russian oil and gas companies. The company that he headed also imported spare parts for Russia Army vehicles and parts for oil wells. Haswani's son-in-law, Yousuf Arbash, manages the company's offices in Russia, where he maintains close ties with Ali Duba, former head of Syrian military intelligence and a senior figure in Hafez Assad's regime, who has been in Russia for quite some time (All4Syria, September 7, 2014). George Haswani is married to an Alawite woman who has connections with the Assad family (The Syria Observer, March 11, 2015). 2. Haswani's name arose as the middleman in the deal between the Assad regime and ISIS in September 2014 (All4Syria, September 7, 2014). His name appeared in the Western media again on March 6, 2015, when it was reported that the European Union had decided to put him on its list of sanctions imposed on individuals and organizations. According to the reports, Haswani acted as a middleman in the Syrian regime's deal for the purchase of oil and gas from ISIS. The European Union did not specify how it arrived at this conclusion. The decision means that he is prohibited from visiting the 28 countries of the European Union and that all his assets in Europe and his money deposited in Europe have been frozen. 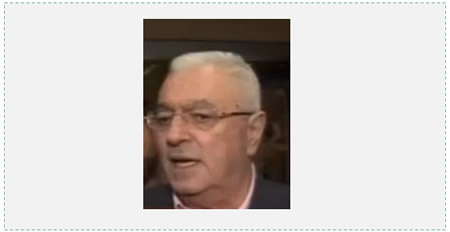 George Haswani, on his part, denied the accusations and threatened to sue the European Union. He said that the European Union has no proof to support the allegations against him. 3. The company that Haswani heads is a subcontractor of a Russian company. 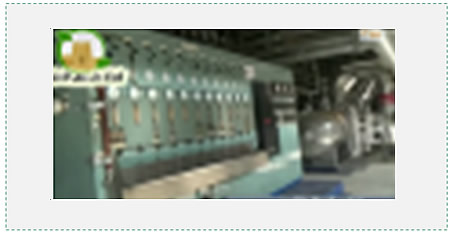 Together with the Russian company, Haswani has carried out projects in Sudan, Algeria, the UAE and Iraq. The company has also started working with the Russian company on the construction of a gas production site in Palmyra, scheduled to be completed in the second half of 2014. In addition, in June 2014, the Russian company signed a contract with the Syrian regime for the first phase of an irrigation project in northeastern Syria. The deal, worth USD 194 million, is for the construction of a main pumping station near the border with Turkey and Iraq. 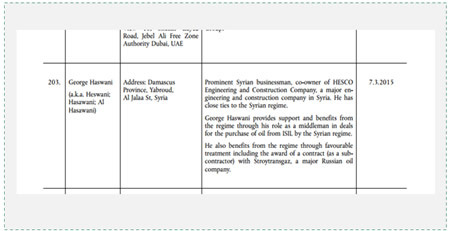 Haswani was present at the signing of the contract and serves as a subcontractor of the Russian company in the project (All4Syria, September 7, 2014). 4. Haswani's company operates the Tabqa gas field (in eastern Syria), which was taken over by ISIS in August 2014.Senior figures believe that this field is operated jointly by ISIS operatives and members of the Syrian regime. The Tabqa gas field continues to supply gas to districts of the country controlled by the Syrian regime (Telegraph, March 7, 2015). According to reports in several British newspapers, George Haswani brokered the deal in which Assad and ISIS will share the profits from the Tabqa gas field. A report published recently revealed that the agreement also includes the employment of ISIS operatives and Syrians who are loyal to the regime, who work at the site side by side (Dailycaller.com, March 10, 2015). Thweinan is a complex of oil and gas fields north of Palmyra. "Implementing Regulation (EU) No 36/2012 concerning restrictive measures in view of the situation in Syria" (March 6, 2015).